- 1 BA, 1 BA, pull out twin sofa, Sleeps 2 or 3 Max. Beautiful beachfront cottage. Located on one of the warmest beaches on the Cape. W. Yarmouth. Newly built. AC/ Cable/ BBQ/all kitchen appliances. Watch the boats go by and the sunset on the deck. Quiet neighborhood but close to shopping and great restaurants. Lots of people who have rented from me have had a wonderful experience and can't say enough about the view!!! No need to fight the traffic the beach is right there! Partial Week Rentals: I will consider partial week rental off season. Before July 1 and after Sept 7th. If you see a week available that is not booked and approaching soon I am willing to work with you on price. Please feel free to call with any questions. I always try to answer any of your questions, I value the people who rent from me and want to make sure you will be happy staying at the cottage. Pets: There are no pets at the cottage. Linens available upon request. Most people bring their own. ( Queen size Bed). Common deck over looking Ocean. Really nice ,cute place ,for two people perfect! Super close to the beach. Amazing spot for vacation. Everytnihg is near buy,so you can walk and see a lot of interesting things. Really good! This was a great getaway for my girlfriend and I. Gorgeous views, warm water, and a quiet neighborhood. The rental is small but that’s not a problem if you’re spending your time outside. Only complaint was that there was no dish soap and minimal paper towels when we got there. Otherwise we had a fantastic week! Super vacaion week for us! Little cozy cottage, super conformable, romantic, close to the beach! All you really need for a nice retreat with your sweetheart! Perfect place for a quiet cape get away. The location is great, the deck area has a beautiful view. Just stayed in this cottage and as someone who grew up on the Cape and in West Yarmouth along with being a travel Consultant who rates locations and accommodations for a living. All I can say is total relaxation. This cute little cottage was perfect. This location is great close to everything but in it's own little bubble at the same time. Private beach and great views. If your looking for quit,calm and relaxation this is perfect perfect perfect. Great for a couple or a girls getaway. Planning to return in September. The cottage has everything you need. Denise thank you for your review. So glad you enjoyed your stay. We look forward to having you again. Perfect getaway place for two! 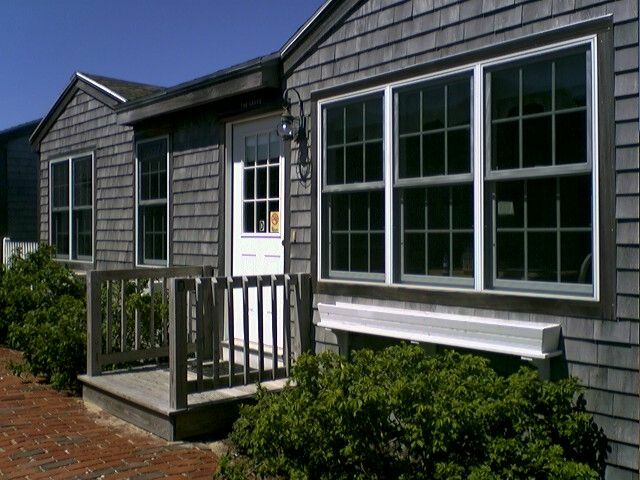 Adorable cottage on the water in a great Cape Cod location. Owner was very helpful with any questions. Would come back again! So happy you enjoyed your stay. We would love to have you visit anytime. Cottage is on the beach in a quiet residential/ seasonal neighborhood. Close to great restaurants and main roads. Hyannis is about 5 minutes away. Chatham 30 minutes. Beautiful landscaping. Located on Windemere Rd. in West Yarmouth off of route 28. Other Activities: Kayak, canoe. Waterpark about 20-30 minute drive. Golf: Plenty of private and public golf courses within 10 miles.